Also, take a look at the Smithsonian's Eruptions, Earthquakes, & Emissions player/viewer as well, to help complete the picture of active geological activity on Earth. "The Smithsonian's "Eruptions, Earthquakes, & Emissions" web application (or "E3") is a time-lapse animation of volcanic eruptions and earthquakes since 1960. It also shows volcanic gas emissions (sulfur dioxide, SO2) since 1978 — the first year satellites were available to provide global monitoring of SO2. The eruption data are drawn from the Volcanoes of the World (VOTW) database maintained by the Smithsonian's Global Volcanism Program (GVP). The earthquake data are pulled from the United States Geological Survey (USGS) Earthquake Catalog. Sulfur-dioxide emissions data incorporated into the VOTW for use here originate in NASA's Multi-Satellite Volcanic Sulfur Dioxide L4 Long-Term Global Database." Windy provides forecasts of global emission of such sulfur dioxide (SO2) gases, from both geological and human sources. Mining of sulfur (Freeport Sulphur Co., Hoskins Mound, Texas in 1943). Images from Wikipedia public imagery sources. Thus sulfur, in the form of atmospheric SO2, is a natural part of the planet's atmosphere and also its crustal mineralogy. But it's also produced as a component of human industrial processes. It can become a locally intense plus also a regionally diffuse chronic pollutant. Especially in and from China due to China's extremely poor and even dangerous air quality within cities and industrial areas. This occurs mainly due to China's almost non-existent SO2 emission control, or else a lack of enforcement of pollution emissions standards within China. Many major Russian cities and industrial sites are also almost as bad, but not as concentrated in areas affected, compared to China. Natural sulfur dioxide SO2 gas emissions constantly occur from chains of hundreds of volcanoes all around the Pacific ocean basin's rim. Such sulfur emission also occurs underwater from millions of hot hydrothermal springs and 'black smoker' metal sulfide 'chimney' structures. 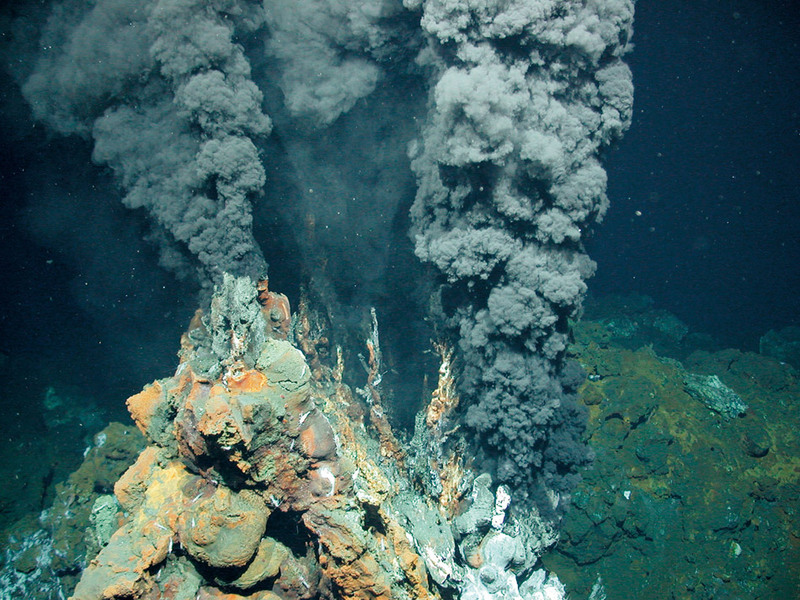 Most of earth's copious SO2 sulfur emission ends up in ocean waters and oceanic sediments. In fact natural sulfuric acid is a component of volcanic and hydrothermal emissions into the ocean and atmosphere. A twilight sky can be colored pink via light scattered from volcanic eruptions of copious SO2 gas injected into the stratosphere - from the Calbuco volcano's eruptions, in this case.